A book about a traveler who fears being unable to commit to marriage? Um, yes please! McCarthy’s book is an absolutely beautiful combination of self-awareness and travel log. As he hops from Patagonia to the Osa to Vienna to Kilimanjaro, McCarthy considers how his love of travel–and the escape it offers–affects his relationship with his father, his children, and especially his fiancee. This combination of physical exploration and emotional introspection hit exactly upon what I too love about traveling. Finding yourself outside of a normal routine, relying on strangers for help, and witness to events and sights totally new–these circumstances of travel offer people a chance to examine themselves in a deeper way than life typically allows. The fact that this can become a crutch, so that self-awareness is dependent upon isolation and exploration, is also explored as McCarthy works his way toward marriage. His honesty and transparency made me trust him and root for him as he found a way to merge his love of traveling with his love for his fiancee. 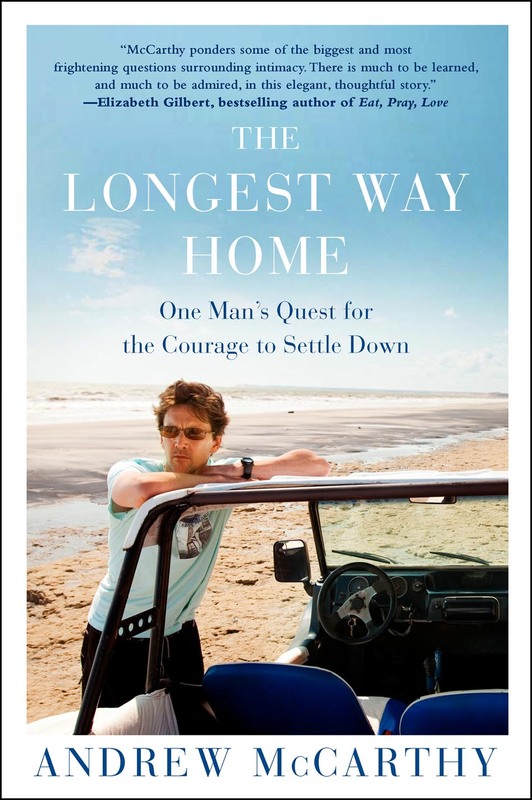 Unable to commit to his fiancee of nearly four years–and with no clear understanding of what’s holding him back–Andrew McCarthy finds himself at a crossroads, plagued by doubts that have clung to him for a lifetime. Something in his character has kept him always at a distance, preventing him from giving himself wholeheartedly to the woman he loves and from becoming the father that he knows his children deserve. So before he loses everything he cares about, Andrew sets out to look for answers. Hobbling up the treacherous slopes of Mt. Kilimanjaro, dodging gregarious passengers aboard an Amazonian riverboat, and trudging through the dense Costa Rican rain forests–Andrew takes us on exotic trips to some of the world’s most beautiful places, but his real journey is one of the spirit. On his soul-searching voyages, Andrew traces the path from his New Jersey roots, where acting saved his life–and early fame almost took it away–to his transformation into a leading travel writer. He faces the real costs of his early success and lays bare the evolving nature of his relationships with women. He explores a strained bond with his father, and how this complex dynamic shapes his own identity as a parent. Andrew charts his journey from ambivalence to confidence, from infidelity and recklessness to acceptance and a deeper understanding of the internal conflicts of his life. A gifted writer with an unsparing eye, Andrew relishes bizarre encounters with the characters whom he encounters, allowing them to challenge him in unexpected ways. He gets into peculiar, even dangerous situations that put him to the test–with mixed results. Disarmingly likable, Andrew is open, honest, and authentic on every page, and what emerges is an intimate memoir of self-discovery and an unforgettable love song to the woman who would be his wife. Previous Article How Will We Be Greeted By God in Eternity?